At least 16 people were killed in Somalia on Saturday in suicide bombings that targeted a restaurant and coffee shop, police said. Suicide bombers walked into the two locations in the southwestern city of Baidoa and detonated their vests within minutes of each other, according to witnesses. The blasts came a day before the first anniversary of a truck bombing that left more than 500 dead in Mogadishu, the worst ever attack in Somalia which was blamed on Islamist group Al-Shabaab. 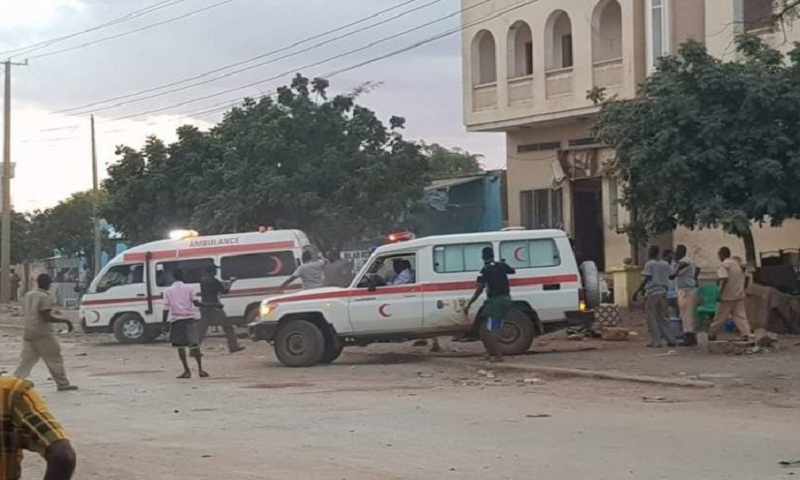 “The number of the dead we have confirmed from the two blasts is 16 and nearly twenty others were wounded some of them seriously, nine people died in the second blast and seven in the first,” said Abudulahi Mohamed, a police official in Baidoa. “The targeted locations are populated by innocent civilians so that all of the victims were civilians, and the number of the dead can increase anytime because of the wounded,” he added. Mohamed Adam, another police official, gave the same toll. “I saw fifteen dead bodies at the hospital all of them collected from the scene of the attacks, many worried people poured into the hospital looking for their relatives” Abdi Hassan, a relative of a patient who was wounded in the blast. Shabaab, an Al-Qaeda affiliate, is fighting to overthrow the internationally backed Somali government in Mogadishu. The Shabaab were forced out of the capital by African Union troops in 2011 but still control parts of the countryside and carry out attacks against government, military and civilian targets seemingly at will in Mogadishu and regional towns.